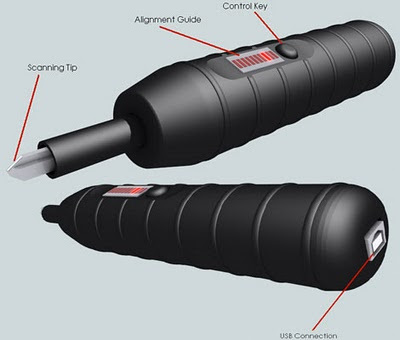 We have been seeing an increase in devices using USB lately, but now what Steve Randall and his friend Ted Schwarzkopf recently reveled may just turn out to be a boon for Locksmiths or thieves!? The Electronic key Impressioner or EKI. It is a prototype device which electronically maps the inside details of a lock using a scanning tool, it then sends information about the locks pattern to a computer via USB. A computer program interprets the pattern and comes up with a key code, depending on the details of the car you have entered before hand. Once you have the code a key cutting machine can use it to punch the key accordingly without having to wait for hours or days. The prototype only recognizes Ford locks. Randall's next step is to make it work/support for a wide range of car companies. The system works only with old fashion keys as modern car keys have transponders fitted, Lock smith already have the way to crack it so its not a problem. As far as security concerned goes, the device will be for sale only to state-licensed locksmiths. But if that doesn't work out, the company will be able to shut down unprincipled systems. When the software starts up, it will have to connect to a database full of updated key codes that system will have the authority stone the device remotely. But still they find a hack for everything and that's why they are criminals. So lets see if this innovate device makes it into the real world with out problems. It definitely will make life of a locksmith easier and for you getting a new key faster. The inventors are also trying to find new possible applications for this device. Filemail: Send Large files for free. Greener Plastic could come from mud.